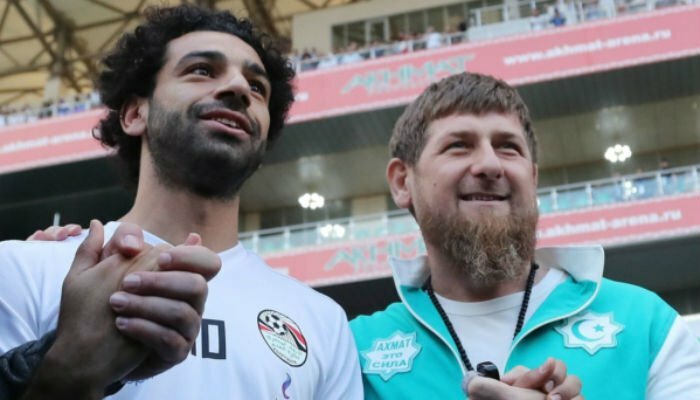 GROZNY: Mohamed Salah, a star attraction ahead of football’s 2018 World Cup in Russia, has made headlines for a smiling photo with Ramzan Kadyrov, the strongman of Chechnya where his Egypt team have set up camp. “Mo Salah was woken from his sleep so a man accused of ‘torture and extrajudicial killings’ could have a photo with him during training” in Grozny, capital of the Russian republic, British tabloid The Sun opined. Kadyrov, supported by Russia´s President Vladimir Putin, rules Chechnya with an iron fist, drawing constant condemnation from human rights groups. According to press reports, he himself went to the Egyptian team hotel to pick up Salah and deliver him for training at the football stadium before 8,000 cheering fans. Officially, The Pharaohs chose Grozny as Egypt´s camp although it is not hosting any matches in the tournament to keep a low profile, away from the media, as they prepare to make their World Cup finals return after an absence of 28 long years. Sporting a turquoise-and-white tracksuit, gushed about Salah, saying the Egypt and Liverpool goal machine was “the best footballer in the world and an overall perfect person”. Chechnya´s president himself is an avid fan of the no-holds-barred sport of Mixed Martial Arts. Tajeddine Soultane, manager of the team´s spanking new hotel, The Local, said they opted for Chechnya “because this is a conservative country… where you don´t find discotheques” and the food is halal in keeping with Muslim religious laws. For the team itself, the Salah-Kadyrov handshake was far less important than whether their star will recover from a shoulder injury to feature in Egypt´s opening match against Uruguay on Friday in Ekaterinburg.